Villa Key Breeze, named after the charm of the Florida Keys, will add to the makings of your successful family vacation. Our beautiful home is situated on Highway27, and is close to both Interstate 4 and Highway 192 with its vast array of restaurants, shops and bars. Although only minutes away from the Walt Disney World Resort, the community is in a peaceful location, which backs on to a conservation area. You will be close to all of the major Florida attractions, and keen golfers will certainly not be disappointed with the varied and many championship courses nearby. Our management company is on hand to help with tee times and any attraction tickets you may require. This is the perfect home and location for your well earned vacation. Villa Key Breeze, is a superior four bedroom home situated at the sought after community of Calabay Parc. Key Breeze has the unusual feature of two master queen size bedrooms with full en-suite facilities, and a third bathroom which is shared by the remaining two bedrooms. Your private fully screened pool faces a southerly direction where you can enjoy the suns rays throughout the day. The extended deck area boasts luxury padded furniture for your added comfort, and ample space to move around. There is also a covered lanai with ceiling fan, where you can enjoy alfresco dining or even a cocktail or two during the early evening. For added security with our younger visitors, all windows and doors leading to the pool area are alarmed. Inside, Villa Key Breeze has four large and comfortable bedrooms, where again, all furniture has been especially selected for your comfort. All rooms have cableTV, and the main master also has a VCR and DVD. A spacious and luxurious bathroom leads off from the main master suite, with large garden tub/bath, separate walk-in shower, twin vanity area, separate powder room and a linen closet. Your second master suite, also queen size, has plenty of storage space, and the full bathroom for this suite leads directly to your pool and deck area. Bedrooms three and four, both twin rooms, are tastefully decorated and share the fun, nautically themed, third bathroom, which again is a full bathroom. The large family room offers you space and light, with high ceilings and ceiling fan, this room has all the comforts of home. Along with large sofa�s and chairs, coffee and side tables, you will also find a CD/Radio/Cassette stereo system. A large screen cableTV offers nearly a hundred channels of programming, you will also find a selection of video and DVD movies for your added enjoyment, and if all that isn't enough, a Playstation2/DVD with family games to keep our younger guests amused. There is also a small collection of books for you read whilst lounging around the pool, and board games to keep the family entertained. Triple sliding doors lead out to the pool and deck area, and these are alarmed for the safety and security of children. A separate kitchen and dining area is at the front of the home, where you can dine in a light and relaxing atmosphere reminiscent of 1950�s New England. Here, you can dine in style. 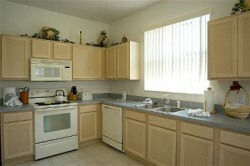 The extra large kitchen boasts all major appliances supplied by Whirlpool. You will find a large oven and hob, refrigerator/freeze with icemaker, microwave oven, dishwasher, waste disposal and a host of other electrical appliances. All dinnerware, cutlery and cooking utensils are provided for your use. The dining area has place settings for eight guests around an unusual square table. From the kitchen, a utility room houses the washing machine and tumble dryer. This room also leads out to the double garage. Villa Key Breeze is air-conditioned throughout. 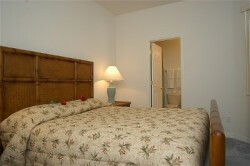 All linens and towels are provided for your use, including pool towels. 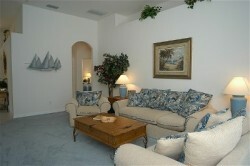 No expense has been spared on this home to ensure you have the carefree and enjoyable vacation that you deserve. Balance to be paid - 6 Weeks Prior to Arr to arrival.